Lower Haight Art Walk Draws Big Crowd — Now, How Soon Can We Do It Again? So what was that thing that happened Saturday in the Lower Haight? The Lower Haight Art Walk, which drew hundreds, was modeled on the Divis art gallery crawl that happened a few weeks ago, but the result was something wonderfully and uniquely Lower Haight. Which is to say, utterly impossible to classify: a collection of seemingly unrelated things that somehow, when brought together, felt strangely correct. Art galleries, bars, a costume shop, a vinyl record store, a business that sells smells — what do these things have in common? Nothing, was our first impression, but no: they’re all neighbors. Not just because they’re in close proximity, but because they could come together to pull of an excellent evening event. By the time we’d surveyed all of the stores, galleries, and bars, it was getting on past 9:30, and the crowd outside Lower Haighter — the event’s hub — was huge. About a hundred people milled around on the sidewalk, listening to the band Miles Ahead West, including Supervisor Ross Mirkarimi. We bumped into Ellyn Parker — as the Divisadero Corridor Manager in the city’s Office of Economic and Workforce Development, she’s one of the many people who made the event happen. 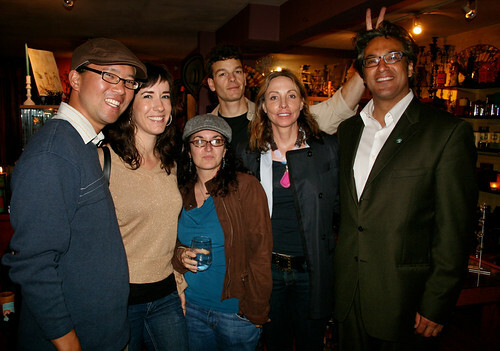 It was going great, she told us; next time they do it — and there will definitely be a next time — Supervisor Mirkarimi suggested that they close down the streets. “We could do it as a Sunday Streets,” she said happily. Of the 29 participating businesses, Xapno was our favorite, and also the most representative. Six years ago, the store opened as a flower shop; but now you can find scarves, books, jewelry made out of typewriters, and notebooks. If anyone else tried to reproduce Xapno themselves, it would be a disorganized mish-mash; but when we asked the owner of the store how she decides what belongs, she just shrugged. She knows, somehow, what belongs, and can maintain a style for the store that customers can feel without being able to define. Nearly every store we visited shared this trait: a collection of merchandise unique to that store, weird and eclectic but also coordinated. For example, Lower Haighter’s collection of art and t-shirts and buttons and toys fit together like a perfect color palette. Down the street at Hydrilla, the style of the t-shirts were a nice match for the still-drying spray-painted mural along the wall. And Upper Playground is basically the Sam Flores Store right now; but there, too, all of the different artists’ work just looks right when they’re all brought under one roof. All of the merchants we talked to hesitated when we asked them how they decided what to sell — because honestly, how can you explain what just feels like it belongs? 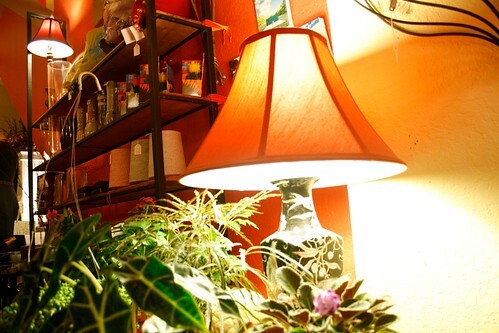 “Beautiful things,” attempted Leah, a salesperson/aroma therapist at a store called Life as she gestured to a Buddha, scented oils, bracelets, a tea set, oil paintings of trees, and some plants sprouting from bulbs. A lot of the art walk participants weren’t actually art galleries — or even displaying much art. But those restaurants, bars, and stores were still supporting the art walk, whether financially, though donated time, or with advertising. One of our favorite stops was Rooky Ricardo’s Records — a gigantic collection of vinyl, tucked in a cozy, warmly-lit den. What is collected more painstakingly than records? 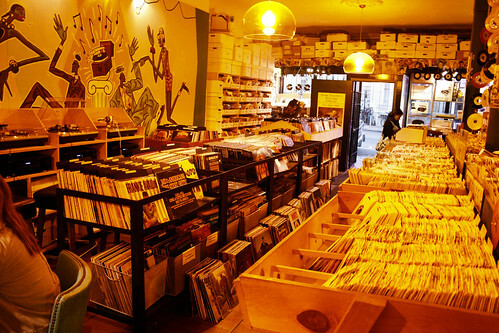 Richard, the owner, has been bringing together just the right music in that store for 22 years; and beyond that, as Treasurer of the Lower Haight Merchants and Neighbors Association, he’s helped to bring together the neighborhood’s stores and residents. It’s a good mix.